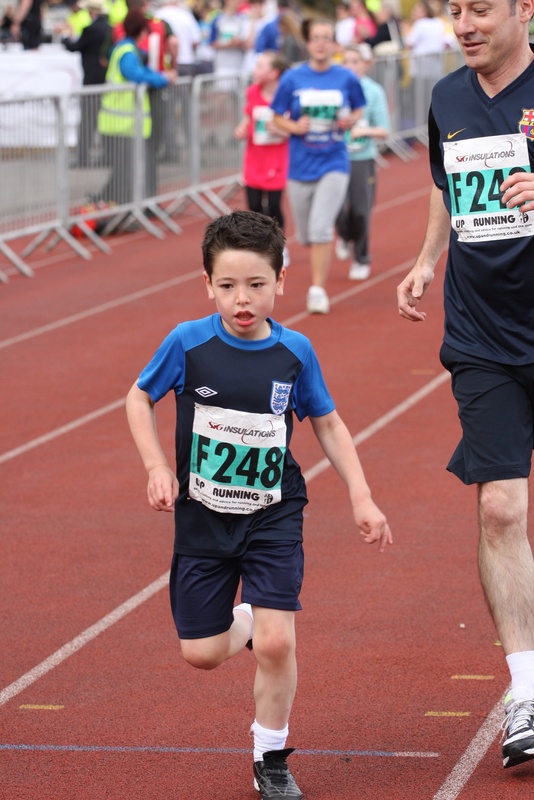 Daniel and Simon Bateman completed the Sheffield Fun Run on Sunday 8th May. Simon is a colleague of Nick’s at work and his son Daniel is a promising 7 year old footballer with AFC Dronfield. They successfully completed the Fun Run and are donating their £90 sponsorship money to the Huw Thatcher Trust. Daniel beat his Dad Simon by inches (just like last year apparently!) It’s a great effort from both of them particularly from Daniel; having the determination to do something like this at his age is admirable. Simon met Huw a couple of times in recent years, notably 3 years ago when Huw joined in the adults five a side football competition at Nick’s work sports day in Sheffield. Huw, Simon and Nick were all in the same team. Huw acquited himself very well that day. We hope Simon has the pleasure of playing football in a team with his son some day. Thank you to Daniel and Simon and to everyone who sponsored them. It’s very touching that they thought to do this and it makes a real difference for us remembering Huw and supporting a great charity.